Today (Monday): Mostly cloudy. Late day rain and snow on Cape Cod, evening snow expands northward. Highs in the 30s. Overnight Monday Night: Light snow in eastern New England. Lows in the 20s. Tuesday: Morning snow exits, then mostly cloudy. Highs in the 30s. The upcoming 10-day forecast stretch is going to be a busy one though it remains to be determined whether any major storms will impact New England, we certainly have several rounds of nuisance events, at a minimum, in the forecast. The first round of snow moves in late today for Cape Cod and Southeast Massachusetts, then spreads across the remainder of eastern New England late evening through overnight, continuing into Tuesday morning. 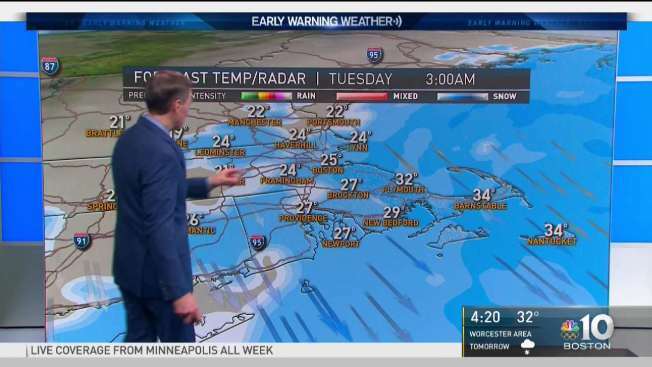 Though snow will never be exceptionally heavy, the continuing light snow will result in a slick start for the eastern half of New England Tuesday morning, meaning some delays and cancellations are possible, though with total snow amounts no greater than about four inches in hardest hit spots, the timing of snow is the biggest impact. By Tuesday midday and afternoon, drier air takes hold again and persists through Wednesday. Milder air arriving Thursday will be accompanied by enough moisture to touch off a few mixed rain and snow showers, and we’ll be closely watching how organized and intense these can become later Thursday into Friday. Again, any snow and rain will be followed by a dry and cold shot of air to start the weekend, with the possibility for yet more snowflakes and raindrops later Sunday into Monday and perhaps, yet again, by the middle of next week. In short, there’s a lot for our Early Warning Weather Team to keep our eyes on in the exclusive 10-day forecast!